When they asked me to help beta test "Beyond The Scale," the first dozen questions running through my head were all about the food: "How many points is..." or "I wonder if fruit is still free?" or "How many points is a Cosmo?!" Sound familiar? Because our love of food, or at least our relationship with food, is what brought us to Weight Watchers in the first place. So the food part is pretty important! BTS is all about teaching us to make more healthy, and more sustainable choices for our meals. Yes, you can absolutely spend all of your points on a bag of peanut M&Ms and spend the rest of the day eating cabbage soup, but you probably shouldn't. Not only is that not sustainable, it also doesn't provide you the vitamins, nutrients and protein in your body needs to adequately fuel itself. Side Note: Also, and you're going to have to take my word for this, if you eat that much cabbage soup, you will stink. I mean it, you're going to smell bad. Don't try it! So let's talk turkey, and chicken and all kinds of other lean protein! Lean proteins all went down in SmartPoints. A shrimp cocktail is now the same as what three egg whites would have been before. How awesome is that? And chicken breast, which is like mothers milk and the most common thing I find in every Weight Watchers users' recipes, also went down. So protein is a good thing! Side Note: I see a lot of people starting to compare the BTS plan to Atkins, and all I can say is "You clearly haven't checked the new SP for bacon!" The new plan focuses on lean proteins, not any protein, and all of your regularly scheduled pasta, rice and bread are still accessible to you through this plan. You just have to PLAN your plan! Things like processed snacks, crackers, cookies, most desserts and quite a few yogurts all went up in points, mostly due to the sugar content or the saturated fat content of the food. That doesn't mean you can't have them, but what BTS is saying subtly is, maybe you shouldn't eat those every day. And as much as I love my chocolate, that's probably a true statement. We don't really need cake every night, do we? Part of the reason is that we know that people tend to over consume juices and other beverages, and under-estimate how many calories they have consumed. We are counting the points values of fruit in smoothies in order to help our members realize exactly how many calories they consume when drinking in order to make healthy choices. Of course, it is still in your hands as members to decide if it is worth the SmartPoints to have a smoothie. What's one food you were SO excited to see go down in SP value? Protein. I love lean protein and am excited to see it go down. I see myself indulging in more shrimp cocktails and fewer cookies this holiday season. Seafood! Seafood is so low in SP, it's practically free! I loved that most proteins went down in points! I haven't investigated far enough to really answer this question, but at least some of my favorites, like chicken w/skin, either went down, or at least stayed close to the same points, so I can continue to enjoy them. I eat a lot of Trader Joe's convenience foods, and so far, most of them are still doable. With the exception of my desserts, of course. Chicken breasts and lean fish! What's one food you're bummed went up in SP value? Do you have a plan for how to make it work going forward? Sweet treats went way up so I'm going to have to me more judicious. One strategy that has worked for me is to be really selective and seek out the highest quality treats possible. I've found that for me the higher the quality, the less I need to be satisfied. This is especially true with good dark chocolate. The increase in SP for olive oil had me concerned initially. BUT, with what I “save” in SP on lean proteins, it usually evens out! I was upset that my fav fat free flavored creamer went up a point and that fat free half and half is now 1 point instead of 0. I'm hoping that this might encourage me to limit my caffeine intake hasn't yet but I'm hopeful!! The massive points increase in my sweets. My favorite candy bar went from 6 to 12 points. As far as a plan going forward, I'm going to continue to work at ways to fit in items that may take their place, while still giving me the satisfaction level. Noosa yogurt. It nearly doubled in points value, so it will be a very rare treat for me now and, even then, only in the 4 oz portion instead of the 8 oz portion. Now, I know I said I was not going to give you a sample menu until Friday, but so many of you asked, so I'm going to share what yesterday looked like for me. I get 30SP daily, but I only ate 28SP because I was full! How is your week going so far? 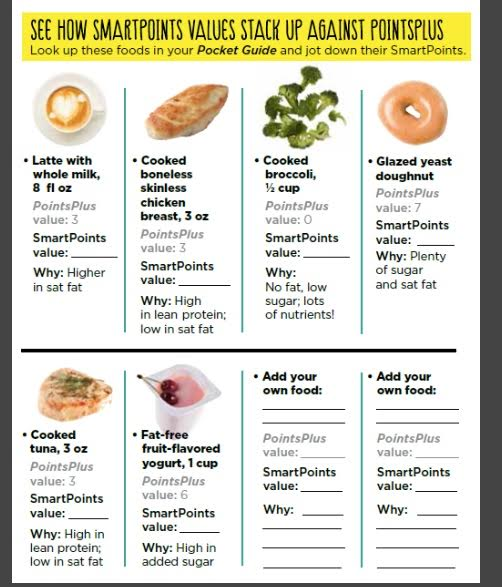 Have you found some new SmartPoints foods to try or add to your menu plans? 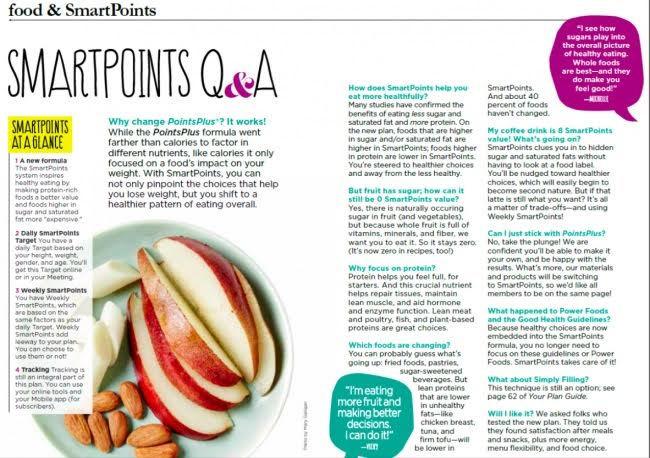 Check out Part 1 "What I've Learned After 3 Weeks On SmartPoints 1!" Check out Part 3 "Working on My FitPoints 2!" Check out Part 4 "How Did You Do It? 3"
Don't forget to follow Trading Cardio for Cosmos 4 on Facebook for tons of recipes, meal ideas and inspiration daily!